Unlike traditional canes, the ground-breaking Campbell Posture Cane helps you to walk in a more natural upright posture position and improves your line of sight. Walk confidently and look forward instead of down, which will help balance and mobility! The revolutionary ergonomic grip handle design eliminates the downward pressure associated with using a traditional cane, making it more comfortable for the shoulder and wrist. The Campbell Posture Cane is self-standing, and the 360-degree rubber traction tip provides added support that helps you stand up from a seated position. Feel more secure when navigating hills, uneven terrain, sidewalks, and stairs! Walk with comfort and gain your freedom back with the Campbell Posture Cane ! 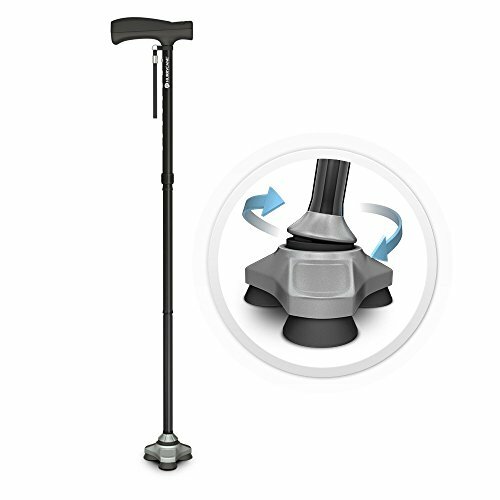 *The Campbell Posture Cane is a medical device intended to provide minimal weight support for walking. It is not intended to relieve or resolve persistent pain, posture, or other orthopedics issues. Please see your doctor if you have recurring posture problems or pain when standing straight. 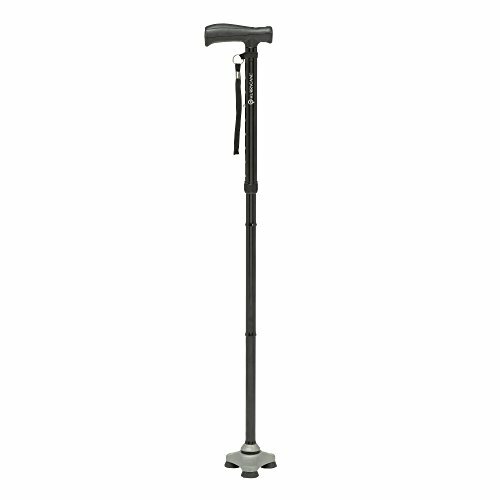 LIGHTWEIGHT AND STRONG: The Campbell Posture Cane is light weight and sturdy that makes it easy to carry with you. Made with high-quality material, this innovative mobility device is designed to serve you for years to come. 10 DIFFERENT HEIGHT ADJUSTMENTS: 10 different height adjustments to customize the fit. Stand-up Self standing for easy reach. stability tip with 360 traction rings. COMFORTABLE TO WALK: The revolutionary ergonomic grip handle design eliminates downward pressure, making it more comfortable for the shoulder and wrist so when you walk. Feel more independent as this cane also helps you easily get up and out of chairs. REVOLUTIONARY CAMPBELL HANDLE: Revolutionary handle helps you to walk upright and changes your line of sight, so you look forward instead of down. Revolutionary handle takes the pressure off your shoulder and wrist. WALK UPRIGHT AND CHANGE YOUR LINE OF SIGHT: It helps look forward instead of down changing your line of sight, which helps balance and mobility. It supports the strength of your body to help you move easier and feel more confident when walking. Providing additional support and stability while walking on any surface, the Vive folding cane is durable, lightweight and adjustable. The collapsible cane also features an ergonomic hand grip to reduce hand and wrist fatigue, a slip-resistant rubber tip to provide additional traction and a convenient storage sleeve for portability. The Vive folding cane smoothly and securely locks in place to provide extra stability for those needing assistance while walking. Folding at three points, the collapsible cane is compact and easily fits into a purse, briefcase, carry on or wheelchair bag. 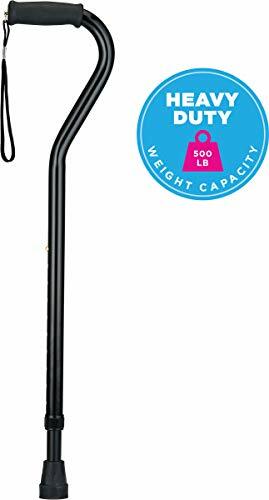 Constructed with a durable, rust-resistant anodized aluminum, the collapsible cane is lightweight yet sturdy, safely supporting up to 250 pounds. The cane is adjustable in one-inch increments from 33" to a maximum height of 37". The ergonomic grip contours to either hand to reduce hand fatigue and relieve excessive pressure on the wrist. The integrated wrist strap keeps the folding cane from dropping to the ground when released. The folding cane is capped with a slip-resistant rubber tip for added traction and stability. The standard size cane is also compatible with most replacement tips, including tripod tips, quad tips and ice tips. COLLAPSIBLE AND COMPACT: Providing a convenient option for those needing assistance, the Vive folding cane smoothly and securely locks in place to provide extra stability while walking on any surface. Folding at three points along the cane shaft, the collapsible cane is compact, easily fitting into a purse, briefcase, carry on or wheelchair bag. 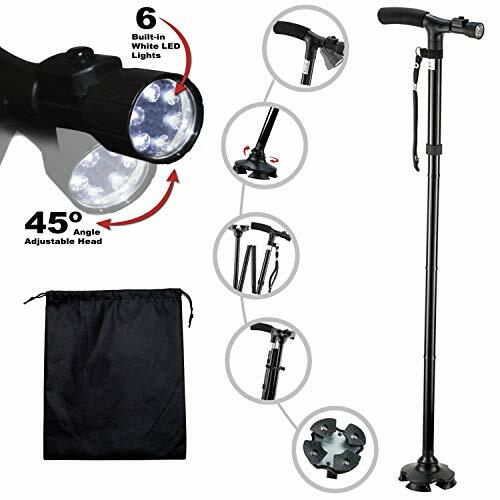 LIGHTWEIGHT ADJUSTABLE ALUMINUM FRAME: Constructed with a durable, corrosion-resistant anodized aluminum, the folding cane is exceptionally lightweight yet sturdy, safely supporting up to 250 pounds. The cane is easily adjusted in one-inch increments from a minimum of 33 to a maximum height of 37. The #1 selling cane on Amazon just got better! This is the cane that is featured on National television! The Freedom Edition includes a re-designed feet locking system with the WhisperFlexTM base design, for a smooth and silent pivot. Inspired by the Most Advanced Machine on Earth: The Human Body. We built it from the ground up to feel like an extension of the body. Engineered with 4 critical innovations: 1. Stabilizes like a foot: Just like the human foot, the HurryCane gives you 3 points of contact for superior balance and stability. It naturally simulates your instinctive walking motion to provide you firm footing on any surface. 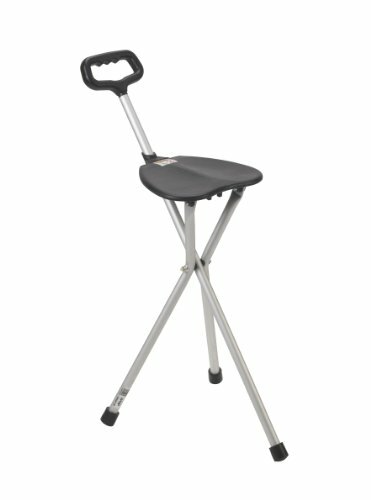 Whether you're sitting or standing, the SteadiGripTM base gives you more traction at any angle. 2. Pivots like an ankle: The ankle is the most complex joint in the body because it has the trickiest job: support your full weight while giving you the flexibility to walk, run and turn on a dime. It automatically pivots to help you maintain balance on inclines, uneven ground and shifting terrain. We designed the HurryCane's proprietary pivoting head to meet the same demanding standards - and it does it all, automatically. 3. Bends like a knee: Your knees bend to help you get in and out of restrictive places like cars. But the HurryCane is even better: instead of one joint, you get 2! When you need to store it in a purse, glove box or under a chair, the HurryCane folds up in seconds to one-third its normal size. And when you need, it flips out instantly. While our cane has two joints, it's still strong and sturdy enough to be pressure-tested to support 350 pounds. 4. Changes in height: People come in all different heights. With just the push of a button, it instantly adjusts to any of 8 convenient heights, ranging from 30.5\" to 37.5". To enhance your mobility experience add these HurryCane Accessories: HurryCane Replacement Feet & the Heavenly Handle. Weight capacity of 350 lbs. 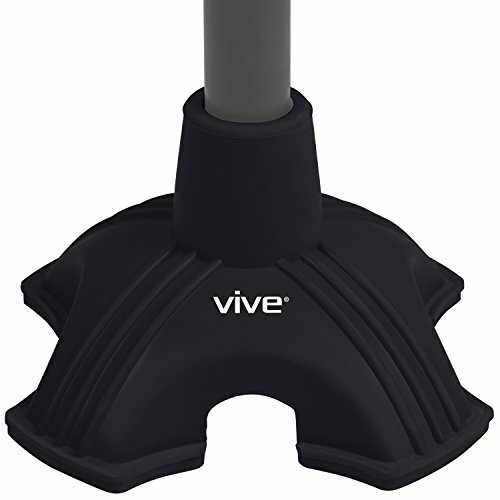 Providing greater balance and stability, the Vive self standing rubber cane tip is easily installed on a standard or folding cane. Constructed with a durable non-skid rubber, the quad cane tip makes walking on uneven or loose terrain easier. 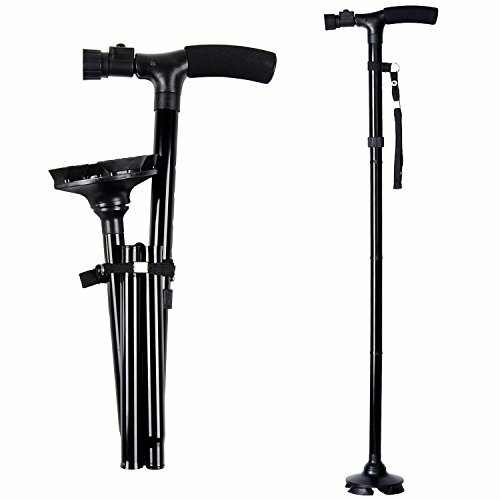 Provides greater balance and stability on any surface when installed on a standard or folding cane. The cane tip flexes and absorbs the impact of each step to effectively reduce fatigue in the hand and wrist. The durable non-skid rubber base provides greater traction and control when walking on uneven or loose terrain, including grass, gravel and sand. The cane tip has four contact points with the floor to prevent the cane from falling over. The compact quad support design also works well on stairs. Easily replaces any standard 3/4" cane tip. Simply remove the existing tip and insert the bottom of the cane into the new rubber cane tip by pushing downward on a flat surface and twisting until fully inserted to prevent instability. 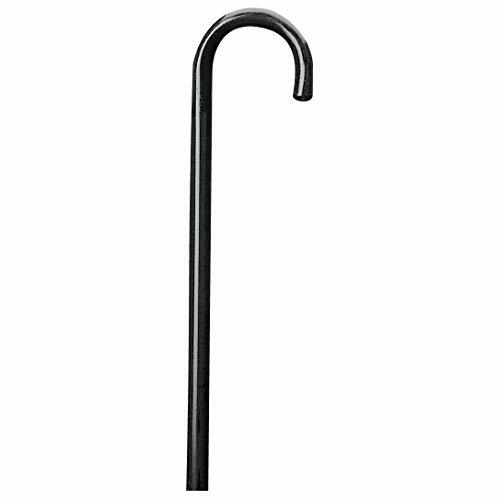 FITS STANDARD AND FOLDING CANES: Easily fits on any standard .75 cane. Simply remove the existing tip and insert the bottom of standard or folding cane into new rubber cane tip by pushing downward on a flat surface and twisting until fully inserted to prevent instability. WILL IT FIT? AGE LIMITS? PLUS SIZE? Read the PRODUCT DESCRIPTION section for all requirements BEFORE you buy. Brand: iWALKFree | Manufacturer: iWALKFree, Inc.
You'll welcome the non-institutional look of our canes and appreciate the fact that their attractive finishes resist marring and scratching to provide years of good looks and dependable performance. Warranty: All AMG Medical Inc. products are warranted against defects in materials and workmanship. AMG's warranty does not cover product abuse or normal wear. AMG's warranty is for the original user only. Started in 1993, NOVA has grown organically with a strong foundation and core values of service, quality and integrity. NOVA s goal and mission is to provide and service superior quality products with great function and fashion for people to live a healthy, independent, and beautiful lifestyle. Our products are designed and manufactured to the highest standards and back by the best warranty in the industry. movements like walking and standing? Have you tried assistive devices but they just didn t work out? Or, have you tried walking sticks and they didn't work out? Have you been looking for that one device that s strong, solid and long-lasting to support you? Well, we have the answer to all of your questions and desires. Introducing the Carex Derby Canes for Men and Women. Unlike most walking canes, this cane s solid structure and finish were designed to be functional and elegant. With its sleek craftsmanship complimented by its majestic derby style handle, this walking cane is the ideal companion for nearly any occasion. Always be confident when moving around or standing. Why? Because it was specifically engineered for those seeking a strong, sturdy walking aid. Never have to worry about gripping issues. Its traditional derby cane style handle coupled with non-bending and non-flaking mechanisms built into its design will give you the confidence to grip it securely without fail(its comfortable too). Be able to navigate across all surfaces. 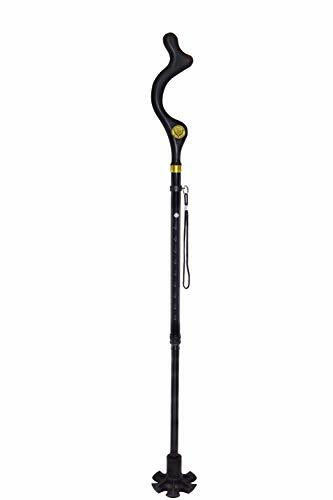 You can literally walk around with your eyes closed without worrying about slipping because this designer walking cane boasts a non-slip rubber tip like no other. Don t miss out on this opportunity to be independent as soon as you can. Get this cane while it s still in stock! Just click Add to Cart and you ll be well on your way to independence. 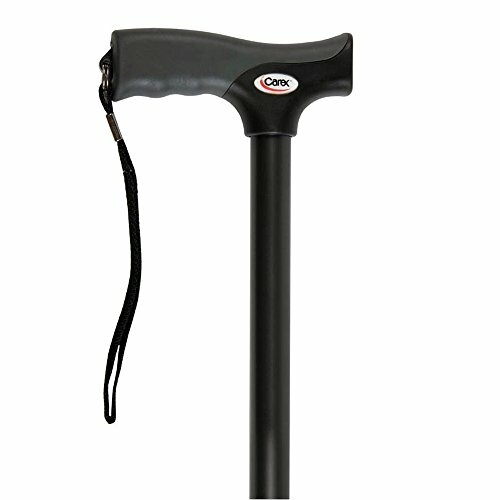 COMFORTABLE WALKING: A derby style walking cane in black. The walking cane features a soft grip latex-free handle to decrease shock and hand fatigue. Easily adjustable height with the push of a button and includes a convenient wrist strap. SOFT GRIP HANDLE: The derby grip handle features innovative technology that decreases shock and reduces fatigue in the hand and upper body. The ergonomic cane handle is adaptable for right- & left-handed users. ANTI-SLIP WALKING CANE: Ergonomically designed, the walking cane has an anti-slip tip to provide extra traction and stability. This cane is a walking cane for men or walking cane for women. TRADITIONAL WOODEN WALKING CANE: With a classically curved smooth & round handle that easily hooks on arm chairs railings or over your arm and a black wooden finish, this sturdy wooden cane compliments any style and lends support when you want it. Unisex item for the elderly man or women and fits inside of luggage, backpacks, etc. 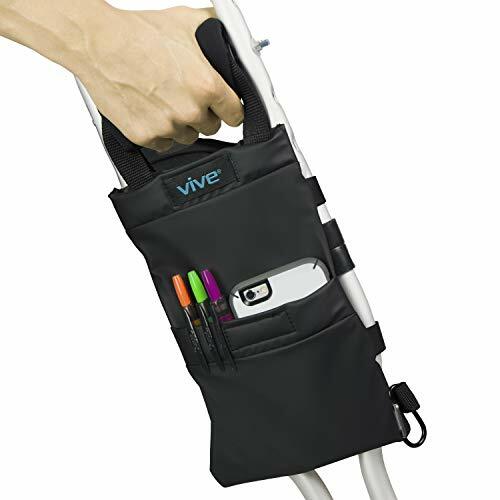 Providing safe storage and easy access to daily necessities, the Vive crutch pouch enables you to keep essential items close at hand. Constructed with a durable, waterproof vinyl, the lightweight pouch has dual pockets for carrying a wallet, phone, water bottle and more, as well as a removable carabiner clip for securing keys. 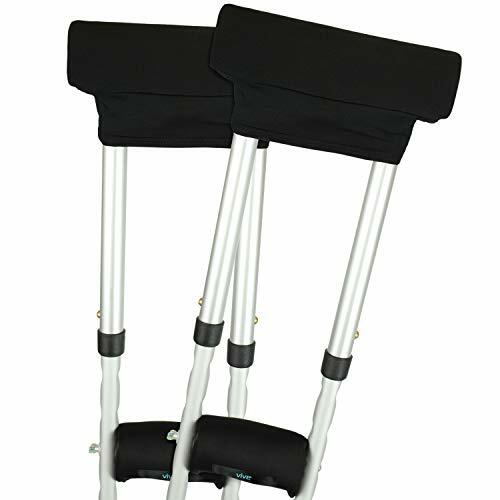 Secured with strong fastener loops, the crutch pouch can be installed on any standard adult or youth crutches. Safely and securely carry everyday essentials in the Vive crutch pouch. Dual pockets allow you to carry loose items such as a wallet, keys, mobile devices, water bottle and more. The pouch includes a small loop and detachable carabiner ring for securing keys and other ringed items to the pouch for added convenience. 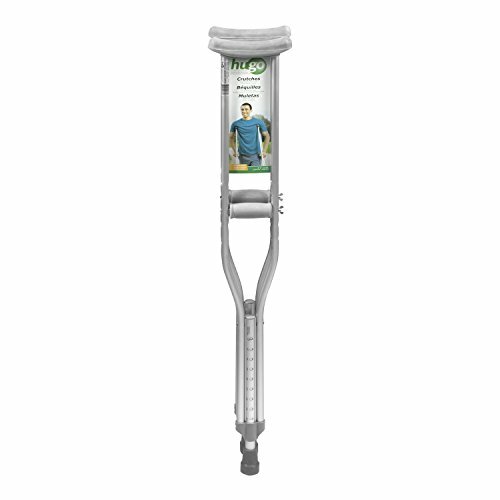 Versatile design adjusts to fit all standard adult and youth crutches. Easy to install on any crutch with six adjustable and removable loop fasteners. Pouch placement will not interfere with handgrips and normal crutch use. Six strong loop fasteners secure the pouch to the handrail and side rails of the crutch. Two long, vertical straps attach to the handrail and are adjustable, allowing the pouch to be secured in position for the best reach. Four side loops provide additional stability for the pouch while the crutch is in motion. Constructed with a durable, lightweight vinyl, the crutch pouch is water-resistant to keep contents safe and dry. The durable vinyl material is machine washable for added convenience. For best results, machine wash in cold water and allow pouch to air dry. SAFELY CARRY THE ESSENTIALS: Safely and securely carry everyday essentials in the Vive crutch pouch. Dual pockets allow you to carry loose items such as a wallet, keys, mobile devices, water bottle and more. The pouch includes a small loop and detachable carabiner ring for securing keys and other ringed items to the pouch for added convenience. EASILY INSTALLS ON ADULT/YOUTH CRUTCHES: Versatile design adjusts to fit all standard adult and youth crutches. Easy to install on any crutch with six adjustable and removable loop fasteners. Pouch placement will not interfere with handgrips and normal crutch use. SECURE NONSLIP FASTENER SYSTEM: Six strong loop fasteners secure the pouch to the handrail and side rails of the crutch. Two long, vertical straps attach to the handrail and are adjustable, allowing the pouch to be secured in position for the best reach. Four side loops provide additional stability for the pouch while the crutch is in motion. WATERPROOF VINYL EXTERIOR: Constructed with a durable, lightweight vinyl, the crutch pouch is water-resistant to keep contents safe and dry. The durable vinyl material is machine washable for added convenience. For best results, machine wash in cold water and allow pouch to air dry. 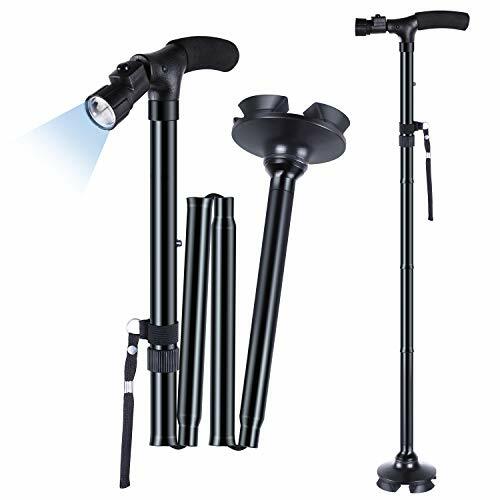 FOLDABLE CRUTCHES: Features a convenient folding system to allow crutches to be easily stored. 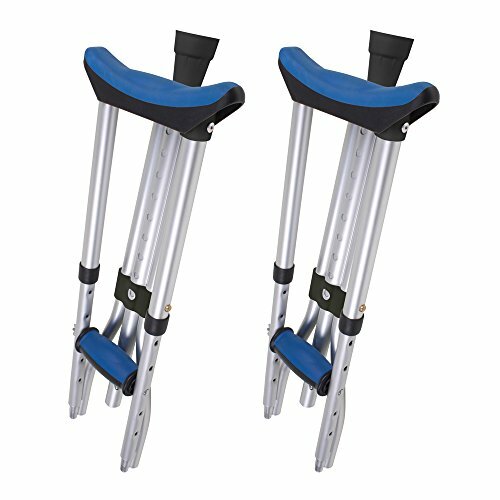 Crutches for kids, adult, and tall users. Height adjusts easily for those 4'11" - 6'4" (41" - 58") . Comes with sporty blue crutch pads and grips. 2 crutches included. 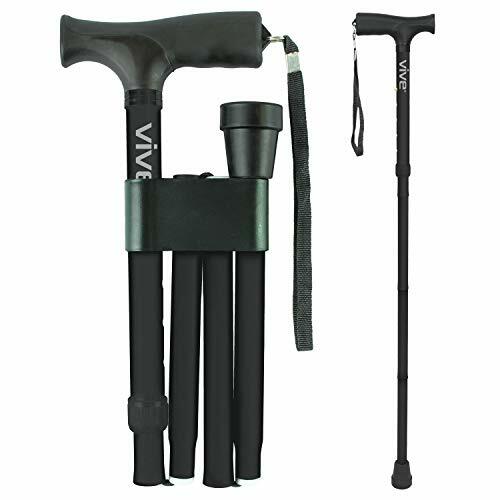 TRAVEL EASILY: Crutches fold up easily, perfect for traveling or taking on an airplane. Crutches fit easily for storage in the airplane overhead compartment once folded up. No more struggling with large, bulky, full length cruches. 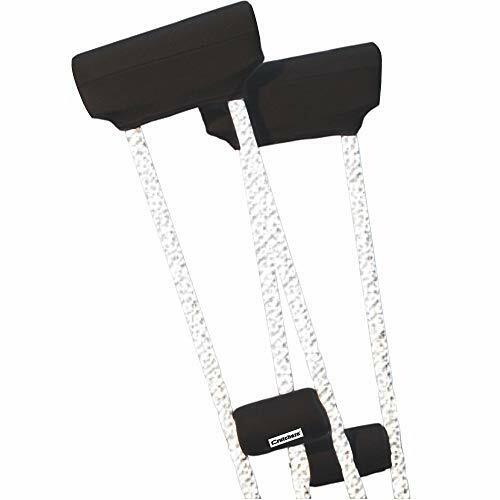 LIGHTWEIGHT ALUMINUM: Crutches for walking are made of aluminum and support people up to 250lbs in weight. Lighter than wood crutches, these crutches are strong, durable, and great for those who don't want to lug around heavy wooden crutches. 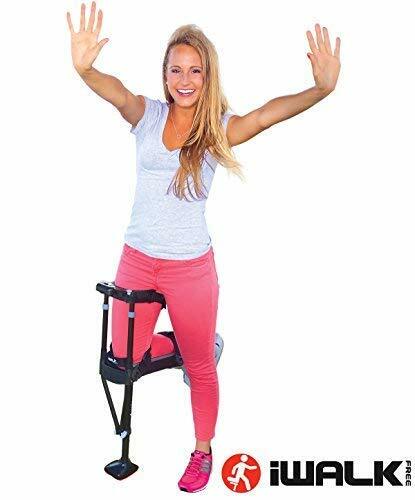 COMFORTABLE CRUTCHES: Foldable underarm crutches that provide comfort while walking for adults or kids. Cruches have thick underarm pads for added comfort. VERY LIGHT: Crutches are durable yet lightweight. Crutches only weigh 4.5lbs. Perfect for children(4'11+) or adults(6'4 or less).